I starred kasketis/netfox at GitHub. Supports Swift 4 and above - bridged also for Objective-C.
For Swift 3.2 support, use version 1.12.1. To bundle only on some build configurations specify them after pod. 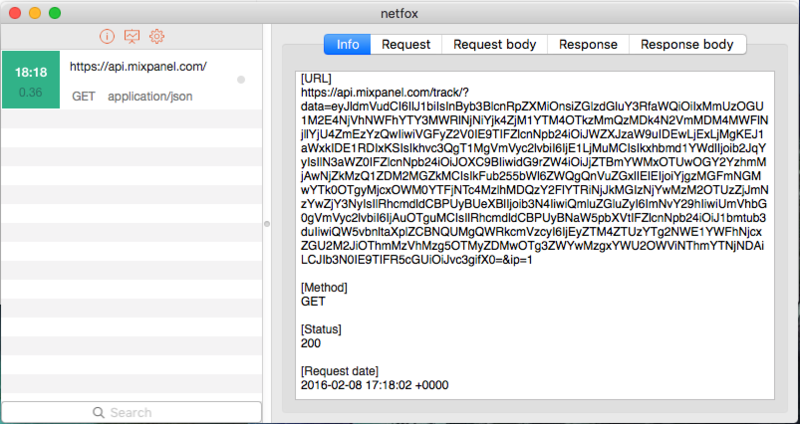 If you prefer not to use dependency managers, you can integrate netfox into your project manually. The above folder contains 3 subfolders: Core, iOS and OSX. to prevent library’s execution on your production app. You can add the DEBUG symbol with the -DDEBUG entry. Set it in the "Swift Compiler - Custom Flags" section -> "Other Swift Flags" line in project’s "Build Settings"
Just shake your device and check what's going right or wrong! Shake again and go back to your app! to stop netfox and clear all saved data. If you stop netfox its view will not be displayed until you call start method again. when you want to hide them. Sharing: You can share your log via email with backend devs or someone who can help. Droar: A modular, single-line installation debugging window. Special thanks to tbaranes and vincedev for their contribution on OSX library! All source code is licensed under MIT License. Which means you could do virtually anything with the code. I will appreciate it very much if you keep an attribution where appropriate.